Arabesque designs-repeating geometric patterns of flowers and animals-are often found in Middle Eastern art and architecture. In Islamic art, these never-ending patterns symbolize a spirituality that extends beyond the visible world. 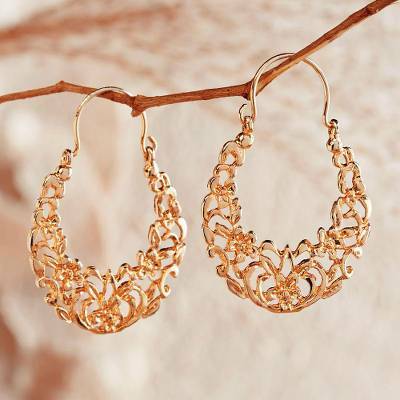 These 24-karat gold-vermeil earrings pair intricate arabesque design with a timeless style. Handmade in Cairo. These are very elegant but I cannot wear them. Cannot get them into my ears. Too bad as I like them otherwise. I just LOVE them. Thank you.